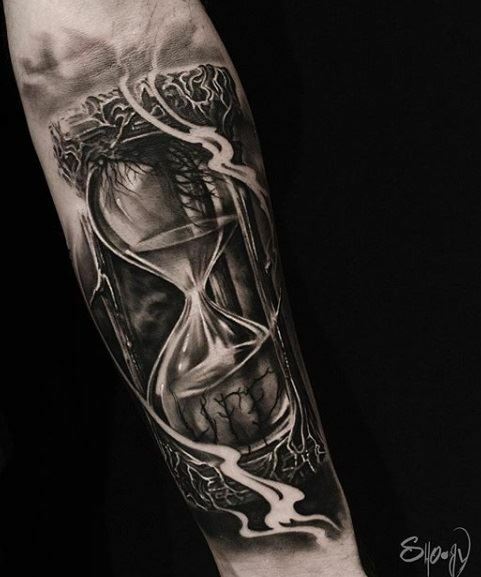 Q: How long have you been tattooing? What inspired you to start learning about this beautiful art form? A: I'm tattooing since 2009. I always liked to draw when I was young. I have started painting only later, I was 25 years old. It helped me to overcome some hard moments in my life. 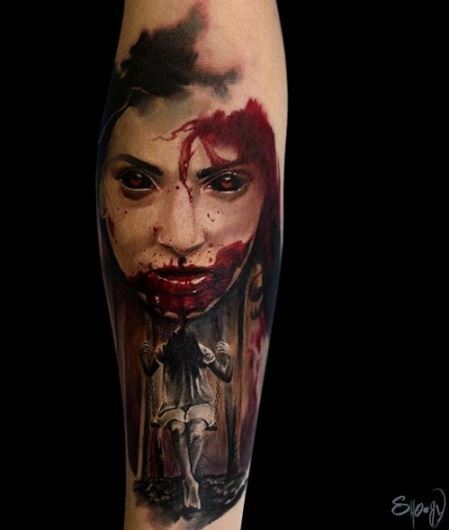 I was already tattooed at that moment and it was still an art wich attracted me. I had a job and I sold my paintings in parallel. After working, I went in a tattoo shop in order to look a friend tattooing. As time by, I started tattooing in this tattoo shop. I took over this tattoo shop and created "Me Gus'Tattoo shop", because this friend opened another shop in another town. The art of tattooing became quickly a real passion. I was alone in this shop nine years ago, we are six tattoo artists now . Q: Was it hard to learn? What is your opinion about tattoo apprenticeship? A: Yes, tattooing is very complicated at the beginning. You have to be very motivated. It needs to have a good drawing level, it helps when you prepare your projects. For my part a pretty tattoo represents 80 % well drawing and 20% technical skills. The lines are more complicated, long time is necessary before you can be able to obtain clean lines. I'm observing that it's easier to progress with big pieces, indeed you've got more time to get you to the project. I still employ many apprentices. It's necessary for them them to learn the basics, but everybody is different and you have to adapt yourself to each personality. It's important to tattoo different styles at the beginning in order to learn different techniques which will be later useful when the artist chooses his specialty. 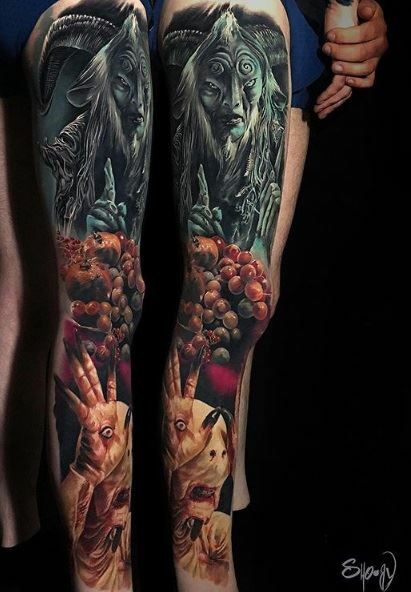 Q: The last decade artists can pride themselves for being able to create realistic tattoos, that gave the tattooing a whole new concept of not just as a designer image but a highly skilled technique that many artists nowadays are trying to learn. It's innovative for sure. Color tattooing especially, as being said many times that color tattoos are a bit more challenging to do. What is your opinion on this? A: It's true that there is an important evolution of the artists who work realistic style. This is very often reprography even if some of them can create realistic pieces, portraits, animals, flowers, skull for example or other, some artists can give a graphic style even surrealism. We're drawing less now, my wife is delighted, it's clean at home! We're spending more time working with Photoshop or Pad Pro for our realistic projects. For my part, the fact of having painted before, helped me a lot to do color tattoos. I don't think that color tattoos are more difficult but we spending more time because we have to choose sometimes a lot of colors and color mixes, so the preparation is a bit longer. Q: What do you prefer color or black & white tattoos and why? 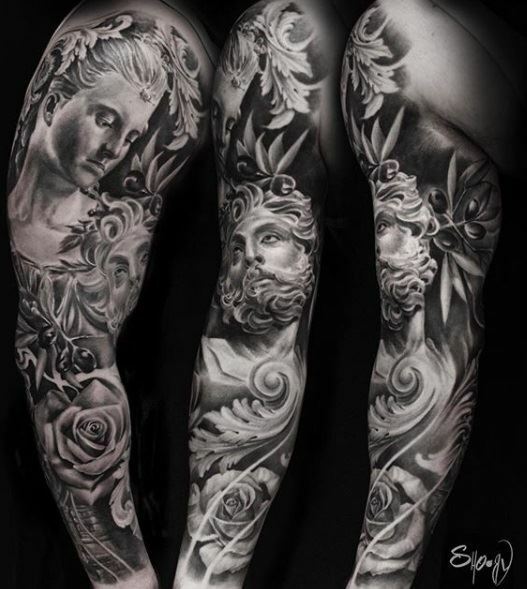 A: I'm tattooing a lot of black and grey pieces and I like it... I put always grey color for my black and grey tattoos. 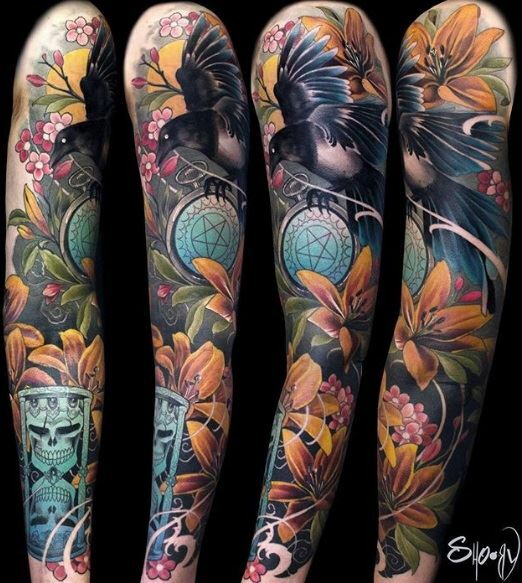 But I prefer color tattoos because for me, they have more dynamism on the skin and they look more realistic. Color tattoos also give more opportunity to do originals projects. 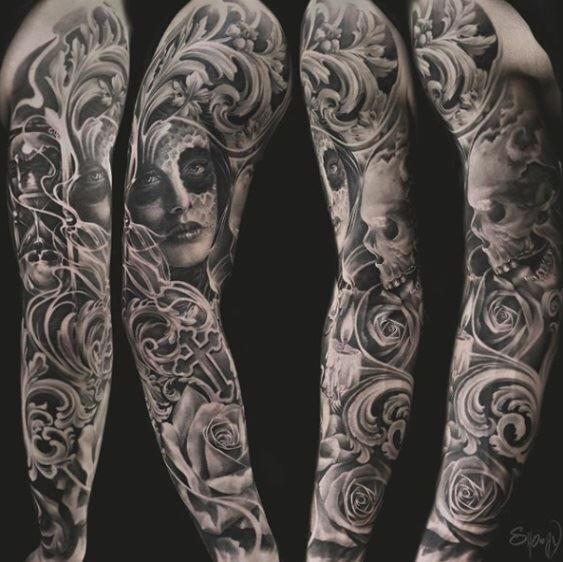 Q: Big tattoos such as sleeves and backpieces can take 4-5 sessions, that's a lot of hard work, patience, and pain for the client, but I believe after it's all done, it's a pleasure for both, you and the client, so it's worth it : ) How much these types of work give you the ability to really show off your skills? Even though small tattoos can be challenging and complex, but however, I think people still consider big tattoos as more of a challenge. A: I'm doing a lot of big tattoos, very often on the arm. The interest of a big piece is that we can valorize the member with negative (virgin skin motions) for example. The pieces can be located accurately and the fact to work big pieces allows to get more details with more impact. I like to apply dark background to intense the edges and the colors. 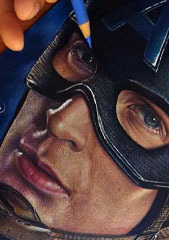 Q: In creating a portrait tattoo, doing the details such as eyes, hair etc I think the artist puts an extra energy to make it looks more "real" the eye expression is probably the most important, however, what are some of the most tricky details you find as "most" time consuming? A: For the portraits, the lips and mostly the hairs require a lot of patience. The hairs require a lot of energy, they are external parts of the faces but they are very important because they produce a beautiful motion and improve the face expression. For the portrait of men, the difficulty can be the texture of the beard and the wrinkles. The eyes are generally not too long to make but require accuracy to get a good translation of the emotion. 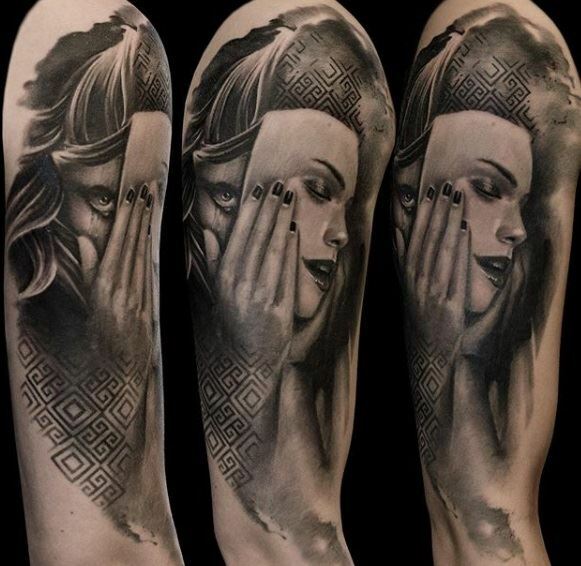 Q: I also like the fact that every tattoo you do looks unique and reminds me of illustrative (graphic) design type of work, so much patterns, a nice play with colors and mixture of many styles in one particular design, really impressive. How do you get inspired? Do you draw a lot for each client or the ideas can come spontaneously? 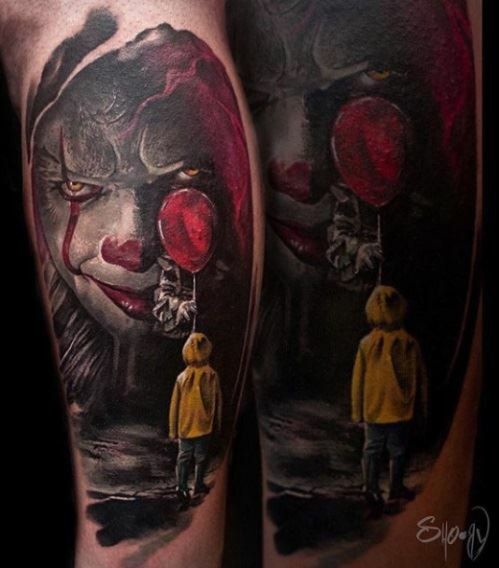 A: The inspiration comes from the experience that I built with the different styles I practiced before I became specialized in realistic tattooing. It comes also from the artists I've met during my career. I usually prepare a digital drawing or a graphic composition at least one week before the appointment. Often, it is just a base for the inspiration then for the color choices and finally, the graphic touch comes in the moment. Q: I think nowadays, as we live in a so-called digital world of so much media, constant pressure for progress and competition, how do you cope with that? Do you have any artists you look up to? A: There is positive thing with media and social networks. The fact to have the possibility to observe high level tattoos can of course stimulate me. It's important to not look too much the others artists work, simply because we can loose our artistic identity. It is better for me to keep a certain distance and sometime to stay alone and keep out social networks and create. Q: I can see many type of tattoo styles that you love doing, have you ever thought doing something completely different? 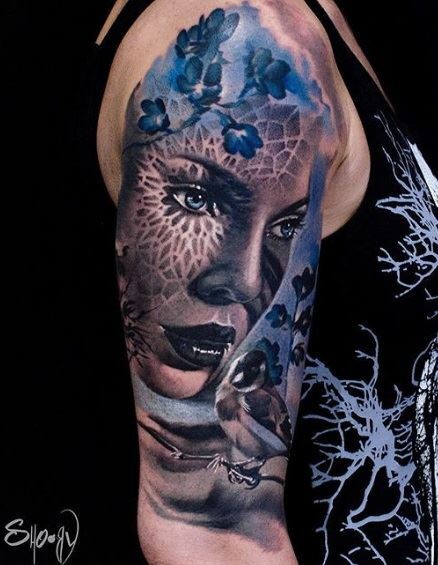 A: I did tattoos in different styles before I was specialized in realism. I'm keeping this style because I prefer it nowadays. I do not think I want to change yet. It could happen. I like a lot Japanese tattoos and I 'm tattooing sometimes this style and neo-traditional too. Q: What would you say to someone who is planning to start tattooing? What is the best approach? A: If someone wants to learn tattooing, I advise a good drawing level, patience before getting a good level as artist. It's too necessary to try different styles before specializing in order to obtain a lot of experience. It's also necessary to find a good team, because the team is very important. At last, it's necessary to surround yourself with good artists in order to learn in the best conditions.